It was months ago that Donald Trump threatened to leave the Republican Party and run as an independent if he felt mistreated by the GOP establishment. Now, another candidate is jumping on that train. 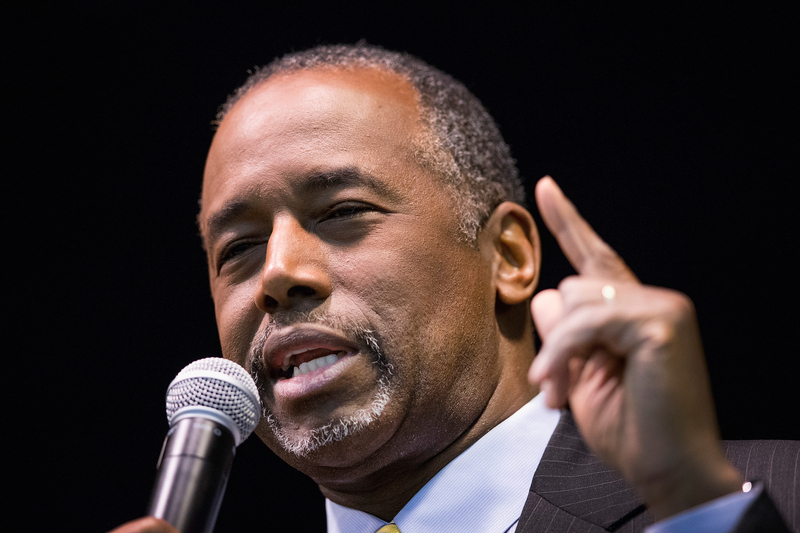 On Friday, Ben Carson said he’ll leave the GOP if Republican officials try to negotiate a presidential nominee at the party’s convention next summer, a possibility that The Washington Post reported Friday. This means that the two top-polling Republican presidential candidates have now both threatened to leave the GOP if they don’t get their way. While it’s unusual for two leading candidates in a presidential race to contemplate leaving their party while still running for that party’s nomination, party-switching itself is not uncommon in the United States. It happens somewhat frequently at the state level, and even high-profile national politicians have jumped across the aisle from time to time. Sometimes, this is simply a matter of political opportunism, as a candidate determines they’ll have a better chance of winning if they remove the “D” or “R” next to their name on the ballot. Other times, party-switching has to do with changes in the parties themselves: The Democratic Party of 2015 is drastically, crucially different from the Democratic Party of 1955, and the same goes for the GOP. Let’s take a look at some of the more high-profile party switchers in recent political memory. That’s right — the former Republican governor of Texas, famous for his efforts to close abortion clinics and prevent kids from learning about contraception, started his career as a Democrat. Perry was elected to the Texas House of Representatives in 1984 on the Democratic ticket, and was a supporter of Al Gore’s 1988 Democratic presidential campaign. But five years later, Perry announced that he was switching parties, and ran for Texas Agricultural Commissioner as a Republican. Perry says he became disillusioned with Democrats after Jimmy Carter’s disappointing tenure as president. Additionally, Texas itself became much more reliably Republican over the next couple of years, so Perry’s switch was in line with the state’s general political trajectory. If anything, it’s surprising that he ever identified as a Democrat to begin with. The former governor of Rhode Island ran for the Democratic presidential nomination in 2016. Before that, he was an independent. Before that, he was a Republican. Chafee served in the U.S. Senate as a Republican from 1999 to 2007. After losing reelection, he became an independent, and ran successfully for Rhode Island governor in 2010. Three years later, after supporting President Obama’s reelection, Chafee announced that he was becoming a Democrat, and ran unsuccessfully for the party’s 2016 presidential nomination. Rhode Island Republicans have traditionally been much more moderate than the GOP as a whole. Chafee’s switch occurred as the national Republican Party was becoming far more conservative, so his switch seems sincere. Crist was the Republican governor of Florida from 2007 to 2011. He then tried to run for the Senate, but when it became clear that he’d be defeated in the Republican primary (by up-and-coming state lawmaker Marco Rubio), he switched his affiliation to independent and mounted a third-party run. Crist lost anyway, and so naturally, he switched allegiances yet again, announcing in 2012 that he was joining the Democratic Party. In 2014, Crist ran for the Florida governorship as a Democrat but lost, and is now running for a Florida house seat. This one falls into the “political opportunism” category of party-switching, as Crist only left the GOP after he started trailing badly against Rubio in polls. Lieberman had long been one of the most conservative Democrats in the U.S. Senate. This came back to bite him during his 2006 reelection bid, as he was defeated in the Democratic primary by businessman Ned Lamont. Undeterred, Lieberman and his supporters created a new independent party, appropriately called “Connecticut For Lieberman,” and the senator ran under that banner instead. He was successful, defeating both Lamont and his Republican opponent in the general election. As with Crist, this was clearly an example of a politician switching parties because they couldn’t win under their previous affiliation. In a masterful and one-of-a-kind troll, Lieberman’s opponents later took control of the Connecticut for Lieberman Party and positioned it as an anti-Lieberman party. The late former senator from Pennsylvania pulled off a rare feat: He switched parties, then switched back again. He ran for Philadelphia district attorney in 1965 when he was a Democrat. After winning, he switched his affiliation to Republican. Specter was elected to the U.S. Senate as a Republican in 1980, and remained there until his death in 2012. But in 2009, he announced that he’d be switching back to the Democratic Party. This wasn’t a trivial matter: Specter’s switch gave Senate Democrats the 60th vote they needed to overcome a Republican filibuster and enabled them to pass much of President Obama’s agenda, most notably the Affordable Care Act.